Fully redesigned this year, the 2017 MINI Cooper Countryman 2017 comes in four versions and is the MINI model that is by far the most versatile and spacious. 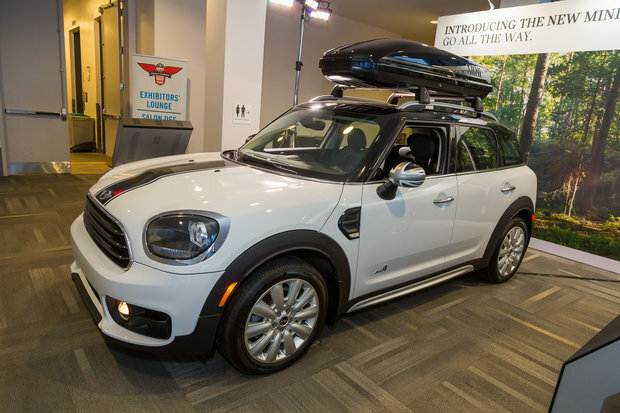 If you want to have that signature sporty and dynamic driving behavior offered by all MINI vehicles while also being able to transport passengers in the back in complete comfort with all their luggage, the 2017 MINI Cooper Countryman is for you. Come and learn more about the new Countryman today at the Ottawa Auto Show. There are four versions available in the 2017 MINI Cooper Countryman lineup. The first, called simply Cooper, is available starting at $ 26,990. It is powered by a three-cylinder engine developing 134 horsepower. It is possible to opt for the all-wheel drive ALL4 system with this model for only $ 28,990. Then comes the MINI Cooper Countryman Cooper S ALL4 offered starting at $ 31,990. The latter is powered by a four-cylinder engine that develops 189 horsepower. Like in every MINI Cooper Countryman model, the S trim is offered with either a manual transmission or of an automatic gearbox. The high-end version is undoubtedly the MINI Cooper Countryman John Cooper Works. Offered starting at $ 38,500, the John Cooper Works version is certainly the sportiest in the range with its four-cylinder turbo engine that delivers 228 horsepower! Behind the rear seats, 2017 MINI Cooper Countryman owners benefit from 450 liters of space with all the seats in place, and 1,390 liters with the rear seats down. Discover the new 2017 MINI Cooper Countryman today at the Ottawa Auto Show. You will see that despite its extra versatility, it is a genuine MINI product!